Being a foodie I am always fascinated by different cuisines and I like to try them in my kitchen. Few weeks ago I picked up this different shaped pasta from my grocery store with the notion to make something interesting. They had a wide range of Italian pasta those were imported and it was really hard for me to pass the aisle without adding them to my cart. Are you interested in knowing different types and shapes of Pastas? If so, check out the list of some of the pastas here. My hubby had the chance to taste snails during his trip to France and he captured the video of the dish to show us what he had. But I have to admit that I am not daring enough to try something that is extremely exotic like that. I can try any vegetarian meal in any cuisine without any hesitation, but when it comes to non-veg I will be finicky. While on his trip to Europe from Work, he found time to visit the French market and got me few varieties of cheese. One among them was a block of Goat Cheese seasoned with crushed black pepper. 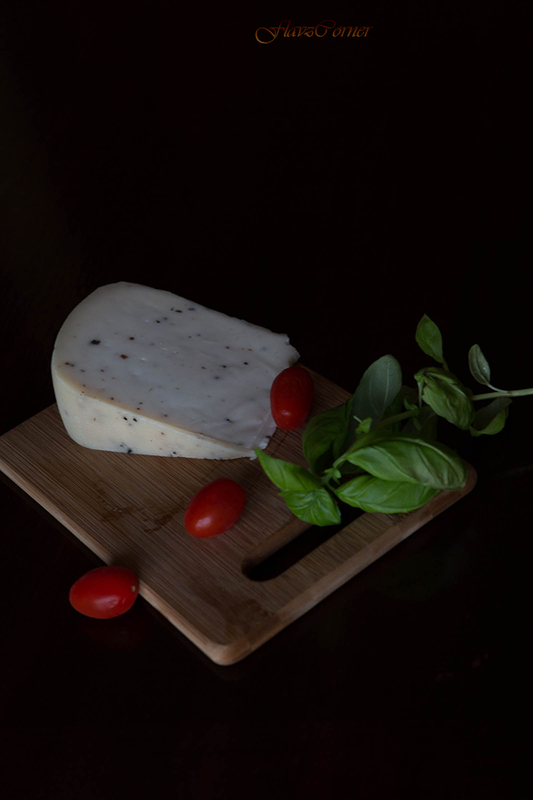 I was thrilled and excited to try the new cheese and there originated my Capunti Goat Cheese combo and it was absolutely delicious. I went again yesterday to check out the grocery store for more imported pasta and there was no trace of such thing in that store. I may have to wait to get this pasta or may have to check some Italian grocery stores for decorative cut pastas. 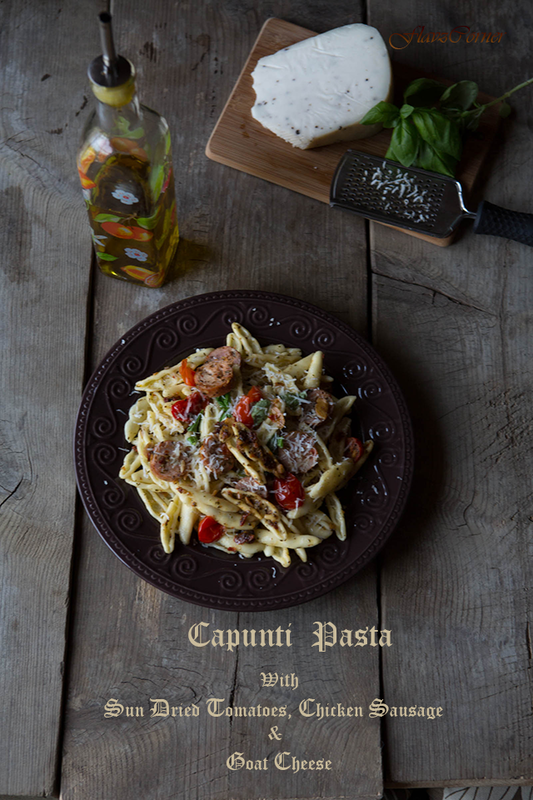 I would say don't turn away from this recipe if you cannot find Capunti pasta, you can substitute it with any tubular or decorative cut pasta those are softer after cooking. The best thing about this recipe is that you can prepare this dish within 20 minutes. Cook pasta in salted water according to the package directions. 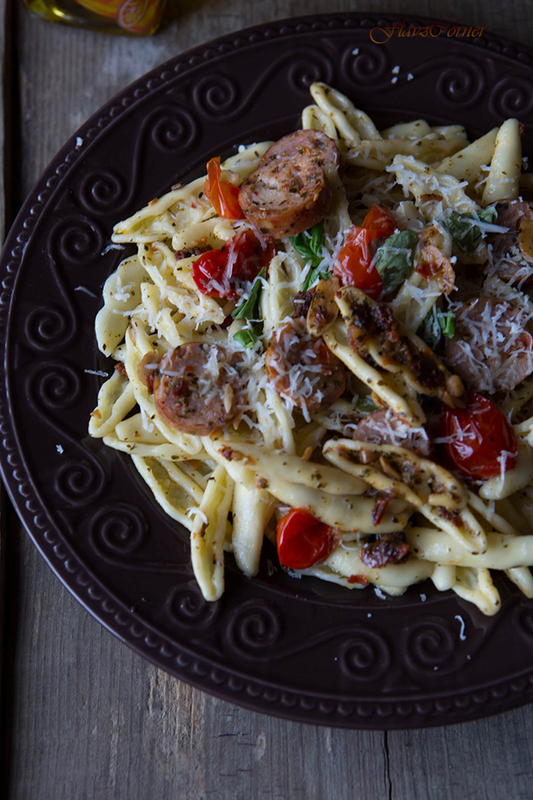 Drizzle 1 tsp of olive oil over the pasta so that they don't stick together. Reserve 1/3 cup of the water in which you cooked the pasta. While pasta is cooking you can roast the minced garlic in 1/4 cup olive oil till golden brown in a sauce pan. Add the Italian herb seasoning, sun dried tomatoes and reserved pasta water. Cook it covered for 2 minutes. Now add the sliced cherry tomatoes and adjust the seasoning with salt & pepper. Add the cooked sausage slices. Cook for another minute and turn off the burner. Mix the drained pasta with the olive oil sauce you just prepared in the above step in a big bowl. Add the fresh basil and grated goat cheese before plating the pasta. 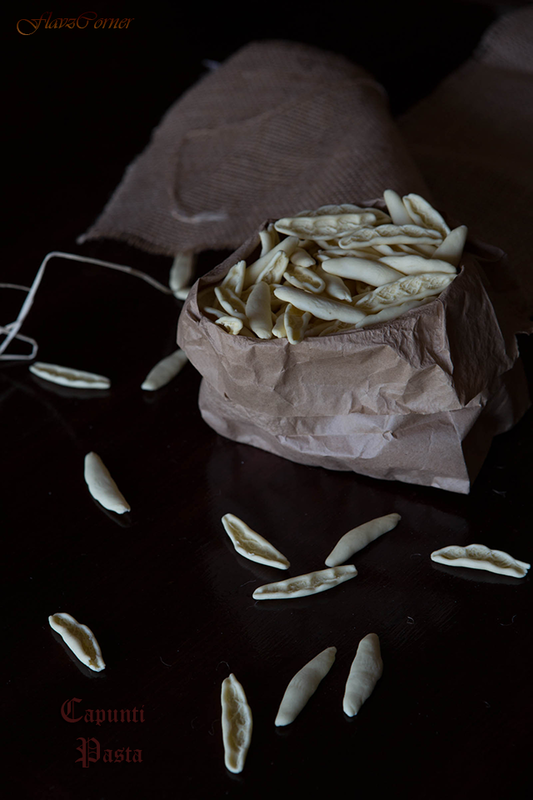 You can use other shaped pasta those are smaller in size if you cannot find Capunti. But Capunti has a soft texture and goes well with this recipe which makes this a special pasta dish. You can substitute Chicken sausage with any sausage of your choice. A new recipe for me. Well made n well captured. Thanks Rafeeda!! I know men are brave enough to try new things. Thanks Indu!!! Long time....hope to see your recipes soon.. Thanks Shweta!!! Isn't the shape lovely? Yes, it is Shema. I packed it for lunch and the flavors were good the next day. Hey Shibi! Nice recipe and I really like the shape of the pasta. Lot of space for any sauce to get in. That;s my gripe with pasta usually (although I never pass up a chance to eat it:P). I have heard from Nisha about snail dish..but I don't think I can try that, my hubby has tried oysters from Paris but I don't think I will try that too...but how did he carry cheese all the way to US ?? Can we keep it outside the refrigerator for so long?? Loved the shape of the new pasta, nice shape to absorb the flavours !! Vinee, the cheese he bought were aged cheese, so they told him that it was OK to keep it without refrigeration for 24 hrs. It was cold there when he bought it and was only 8 hrs flight from US. So it was fine. What a stunning pasta dish!!! I could go for a bowl right now... for breakfast! It's acceptable to eat pasta for breakfast, right?! We go to a french restaurant here and they are famous for their snails. I have seen people eat it and relishing it. Somehow it have never looked appetising to me. Never heard of Capunti pasta but looks really good and goat cheese is my fav! Haven't made any pasta dishes in a hile...i'm tempted! What a pretty pasta shape! I've never used that -- definitely need to look for it. Great dish, too -- so many vibrant flavors. We eat pasta often, and this is definitely something we'd like. Thanks so much. ur clicks are ssooo stunning, Shibi !!! classs ! Success! I made this tonight. It was very yummy with some crusty bread! Definitely a keeper for the rotation.